If you belong to a certain backward community, the caste certificate is a proof of that provided by the state government. There are various incentives and opportunities which the government provides to the people of backward classes but to avail those, you must have the caste certificate. These opportunities are provided to meet the financial needs of the backward class people. There are some advantages and fee reduction for the backward class people in schools and colleges too. The application procedure to get the caste certificate in Chandigarh is quite simple. The whole procedure is mentioned below to help you apply easily. First of all, you have to download the required application. The direct download links are given below for your help. After downloading print it out on A4 sized paper. Fill up the application form with correct information and attach all required documents with it. Submit the application to your nearest Sub Divisional Magistrate office. You can also submit it to the Tehsil office. If you are the first applicant of your family, the verification will be done very strictly. An official will be sent to your residence by the Sub Divisional Magistrate for verification purpose. After all found okay in the verification, the caste certificate will be issued from the Sub Divisional Magistrate office. While application, you must make sure that the application fee of Rs. 1.25 need to be paid as the court fee stamp. An affidavit also must be attached with the form which needs to be attested by the local area magistrate. Address Proof: Ration Card, Voter ID card, Property Papers, Passport, Passbook of Bank Account, etc. Age Proof: Birth Certificate, School Certificate, Aadhaar Card, PAN card, etc. 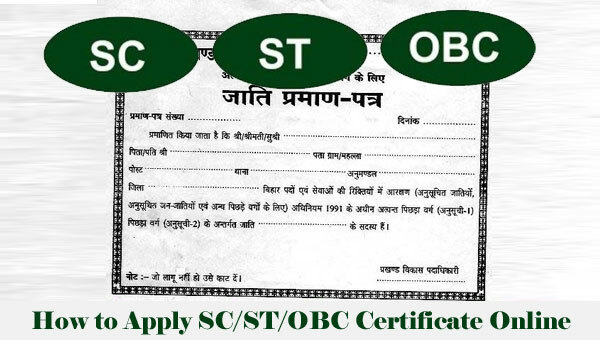 Application Form for Scheduled Caste Certificate (Bonafide Basis): http://www.chdsdmsouth.gov.in/esopb/pdf_files/sc_bonafied.pdf. Application Form for Scheduled Caste Certificate (Migration Basis): http://www.chdsdmsouth.gov.in/esopb/pdf_files/sc_migration.pdf. Application Form for Other Backward Class Caste Certificate (Bonafide Basis): http://www.chdsdmsouth.gov.in/esopb/pdf_files/obc_bonafied.pdf. Application Form for Other Backward Class Caste Certificate (Migration Basis): http://www.chdsdmsouth.gov.in/esopb/pdf_files/obc_migration.pdf. Let us know your queries and suggestions via our comments section. Stay tuned for more such intriguing articles.